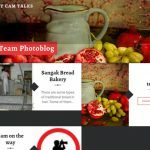 Yesterday I installed MyCamTalks.com team photo blog in English and Persian. I uploaded some photos and their comments there. This photo blog has been created by Javaneh Azimi and I, in order to have a better communication with people all around the world. We strongly believe that Instagram and other social media cannot cover our needs, however, we will continue to upload and share our contents there, but complete contents and big size photos will be uploaded to this site only. We (current and new site members) will upload daily photos there, there is no limitation about the subjects and location of photos, but photos will be taken by the members. So you should except many original photos there.